Megan Faraimo was all but unhittable in five shutouts at the Michelle Carew Classic. Photo by Patrick Takkienen. Each tournament featured 32 top teams and ended Saturday night and with both events being dominated by top hurlers in their respective states. If you'd like to nominate players for future consideration, email us at info@extrainningsoftball.com. We're looking for top performances in high school play each week that can be on a single game or cumulative week basis. We're only five weeks into naming Extra Inning Softball National High School Players of the Week and, amazingly, we have our first repeat honoree. Megan Faraimo holds Carew Classic Pitching MVP Award. Photo by Dan Albano, Orange County Register. 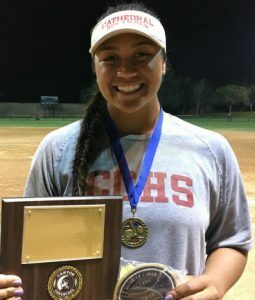 If, however, you had to pick one likely candidate, the name should be no surprise-- it's the top-rated pitcher in the Class of 2018 and perhaps of all pre-college age divisions in Megan Faraimo of Cathedral Catholic High in San Diego, California. The UCLA signee was our first National Player selection of the 2018 season for the week ending March 11 and she captured the award a second time this week by dominating the competition at the Michelle Carew Classic in Anaheim over the last few days. The championship win made it five shutouts in five games for the pitcher in the tournament including a no-hitter. 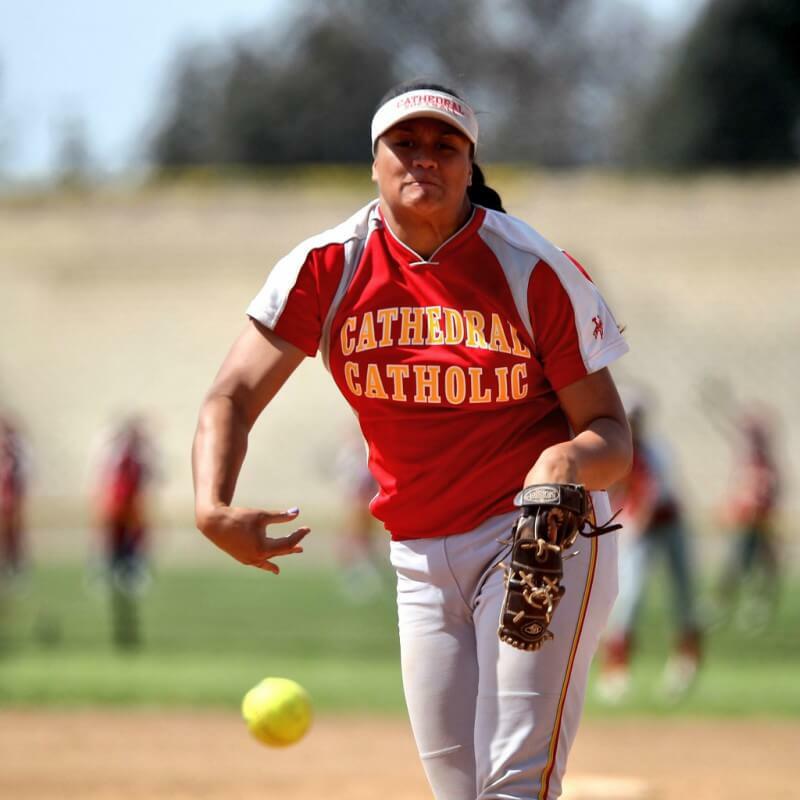 Overall, Faraimo gave up just nine hits with 59 strikeouts in 27 innings for the tournament and if not for a leadoff infield single to start the third by Orange Lutheran, the future Bruins hurler would have had her second no-hitter of the event. Coming into this weekend, Faraimo had a 9-2 record and a 0.31 ERA with her only two losses being by the scores of 1-0. Not surprisingly, the San Diego senior was selected as the tournament's Most Valuable Pitcher. 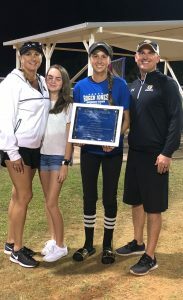 We profiled Madysn Davis on Wednesday and noted that she led Oakleaf to a Kissimmee Klassic title last year as a sophomore and she did one better than that this week—she led the Knights to a repeat championship win and was honored as the tourney’s Most Valuable Pitcher. Madi Davis holds the Tournament MVP along with her proud family surrounding her Saturday night. Entering the Klassic, the defending 8A champions were ranked as the 3rd seed in part because the team had lost five seniors to graduation from last year, but Davis proved that the Knights are still a force not just in the Sunshine State, but on a national level. For the weekend, the Central Florida commit went 3-0 with 21 strikeouts in 17 innings and compiled a 1.11 ERA. She also beat the #6 and #10 ranked teams in the state at the 8A level and the #4 rated squad at the 5A level. On Thursday, Davis pitched 3 2/3rd innings in a 4-1 win allowing only two hits with five K’s over Timber Creek and pitcher Lindsey Hendrix, a Syracuse commit. Next against defending 5A state champ Eustis High on Friday, the Oakleaf hurler gave up a first inning run and then shut the door for the rest of the game until the Knights score won the game on a walk-off two-run hit by Florida commit Baylee Goddard to squeak out a last inning 2-1 victory. After beating Stoneman Douglas in the semi-final game earlier Saturday, the Knights faced the 2015 8A State Champs and undefeated Bartow High for the title, but Davis used her unpredictable change of speeds to scatter three hits and record six strikeouts in a complete game 7-2 win over the Yellow Jackets to complete the repeat Klassic championship, only the third time in 26 years of the event a team has won back-to-back titles.